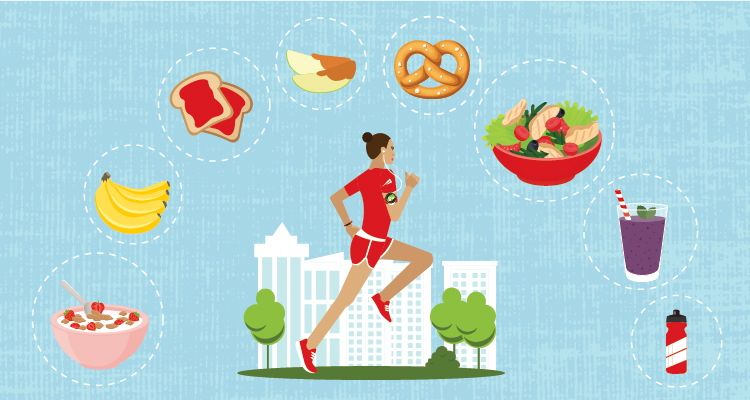 Stacy Kennedy , MPH, RD, CSO, LDN, a senior clinical nutritionist at Dana-Farber Cancer Institute, American College of Sports Medicine certified fitness specialist, and former member of the Dana-Farber Marathon Challenge team shares her favorite recipes for all stages of marathon training. • Veggie omelette: Fill with diced vegetables of your choice. Enjoy a slice of whole grain toast topped with avocado on the side. • Spinach salad with grilled chicken or roasted chicken breast topped with quinoa, cherry tomatoes and roasted pumpkin seeds. Drizzle with balsamic vinaigrette. • Mediterranean Salad: Mesclun greens topped with roasted chickpeas, cucumbers, kalamata olives, artichoke hearts and feta cheese. Add a hard boiled egg for additional protein. Drizzle with Greek dressing. • Soups are an easy way to get all your nutrients in one dish! Look for soups with colorful vegetables, lentils and lean meats. • Carrot sticks, cucumber slices or pepper strips dipped in hummus. Try roasted red pepper or sun dried tomato hummus for extra flavor! • Lemon baked cod over 1 cup of quinoa or brown rice. Fill half of your plate with sautéed green beans or vegetable of your choice! • Turkey Tacos: Fill corn or whole wheat tortillas with ground turkey breast, diced avocado, tomatoes, black beans and lettuce. Sprinkle with shredded cheese and cilantro. • Dark chocolate squares (1oz, at least 70% cocoa)- source of magnesium! • In a large pot, heat the oil over medium-high heat. Add onion and cook for 3 minutes or until soft. Add garlic and cook 1 minute. • Stir in broth, tomatoes, beans, and paprika. Raise heat to high and bring to a boil. Add sweet potatoes, cover, and reduce heat to low. Simmer 10 minutes or until potatoes are tender. • Scoop out 1 cup of stew and puree in a blender. Return puree to the pot. • Add chicken and simmer until heated. Add the salt and pepper. Ladle into bowls and sprinkle with parsley. • Pasta Salad: Whole wheat or gluten-free pasta with shredded carrots, broccoli and chickpeas. Add chicken, salmon or tuna for protein! Toss with dressing of your choice. • Cheese stick with carrot sticks and hummus. • Baked salmon served over a bed of roasted asparagus. Add baked or mashed sweet potatoes. Enjoy a small salad on the side! • Grilled bison burgers: Build a burger using whole wheat buns, lettuce, tomato and red onion. Add an arugula salad topped with thinly sliced pears, walnuts and lemon vinaigrette. Learn more about the Dana-Farber Marathon Challenge team’s mission to conquer cancer.